I planned on giving this book a shout-out at some point or another, but now seems like a particularly good time, as I just had the pleasure of listening to its author, E. Lockhart, share her wisdom about writing and publishing at Kindling Words a couple weekends back. 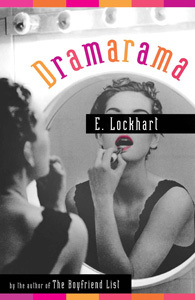 I’ve read all of Emily’s YA novels, and adore all of them, but Dramarama was my first and remains my particular favorite. It doesn’t seem to get nearly as much love as the Ruby Oliver books or The Disreputable History of Frankie Landau-Banks, which makes me want to talk about its awesomeness even more. What makes Dramarama so awesome? Well, there’s the incredibly authentic voice of its narrator, Sadye, who is smart and funny and dissatisfied and complicated in all sorts of wonderful ways. There is her devoted-but-far-from-perfect relationship with her best friend, Demi, who is black and openly gay and a complete and engaging character, never a message or a token. There’s the unique setting at a summer drama camp. But most of all, there’s the ending, which I can’t say much about without spoiling, but I love love love that it doesn’t shy away from the reality of Sadye’s situation to force a happy ending, and I think it is happier because it is real. Want to check out the book for yourself? Leave a comment on this entry by the end of Friday, February 11, and I will send a copy to one commenter! Selected by random draw, open to readers from all countries. I love E. Lockhart’s books, and your description has sold me! Although my favorite is Frankie, “Dramarama” is up there even though I had no drama camp aspirations whatsoever growing up. The happy ending (with the texting) did bring a smile to my face. ive never read any lockhart books yet either, and i would really like to try!! I just finished reading Frankie and ADORED it. I’m listening to Fly on the Wall right now. I’d love to give this one a read as well. Thanks so much for the chance!